The 2010 David Rodan Cup secondary schools footy tournament will get underway later this week in Fiji. David Rodan has more than just his name associated with this tournament, and is working hard in Fiji currently, including generating a fair level of pre-tournament news coverage. On September 20, Fijilive.com reported AFL Fiji begins preparation for Rodan Cup. A follow up 8 days later, More schools confirm for David Rodan Cup indicated that 8 schools, 4 more than the 4 in 2009’s inaugural tournament had committed to take part. In 2009, Suva Grammar School, Gospel, Cathedral and Laucala Bay Secondary School took part, and as at Sept 28, Sila Central, Lelean Memorial, Marist Brothers High School and International Secondary School had all confirmed for 2010. More than 12 new schools have shown great interest to join the new sport that was only introduced to Fiji last year. Top rugby union schools like Marist Brothers High, Lelean Memorial, John Wesely College and Ratu Sukuna Memorial School are some of the top schools to join the competition. 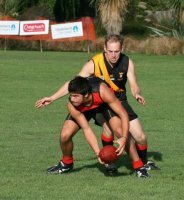 Fijitimes.com has followed up on Sunday, October 18, with Rodan confident of AFL success. Also, on RadioFiji, Robert Wolfgramm was recently able to promote the event. RadioFiji ran a follow up on Monday confirming that 8 schools will be taking part. All indications are that AFL Fiji will be running a great tournament this weekend and that version 3 in 2011 might be even bigger and better. There certainly appears to be some excellent momentum and positive and widespread coverage. With AFL ambassadors such as Rodan, Alipate Carlile and Nic Naitanui, the benefits of players able to be marketed is clearly obvious.